In the eastern Canadian Rockies near the border, Logan remembers living as a fur trapper a long time ago. Logan’s memories continue, specifically crossing paths with a Blackfoot Indian youth fighting a demonically possessed black bear. Against his better judgment, Logan attacks the bear with his two long knifes after his rifle proves useless. Killing the beast, Logan is flung against a gnarled tree and finds himself impaled on one of its broken branches. Three American trappers happen across the scene and presume, understandably, that Logan is dead and fair game for scalping. Unfortunately for them, Logan proves not to be dead and kills two of the Americans with his knives, while the Indian boy kills the last of the trappers. Logan collapses in a heap as Blackfoot Indians arrive. 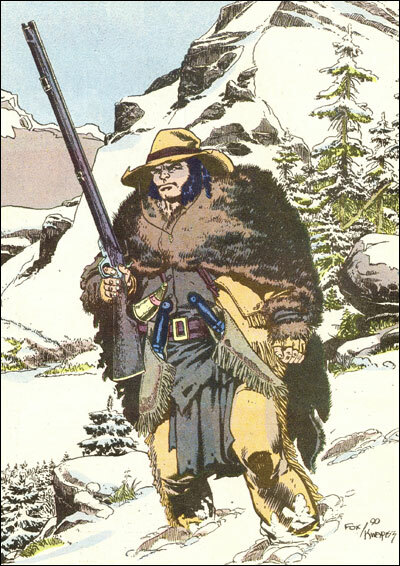 One of the American trappers calls Logan a ‘Hudson Bay Company thief,’ a reference to the Canadian trappers who worked for the Hudson’s Bay Company on the Canadian-American border from 1670 into the twentieth century. The Blackfoot Indians lived freely in the region until 1883 when the near extinction of buffaloes led them to Indian reservations. This extinction forced many natives into the fur trade, creating so much anarchy that the Royal Canadian Mounted Police were forced to dispatch officers to restore order in 1894, resulting in the creation of Fort Calgary. It is possible that this small tribe of Blackfoot Indians is independent of those who moved to reservations, placing these events anywhere from the mid 1900s to the very early 1910s. I should mention that a particularly astute reader notes that Logan’s comment about his knives (“A little gambler from Natchez once gave’em to me. Made’em himself… last I heard, he was holed up in some God forsaken mission down in Texas, with the whole blamed Mexican army after him.”) were originally intended to reference Jim Bowie and the Alamo, circa 1836. Since we know that Logan wasn’t born until the 1880s, we need to chalk these comments up to hyperbole on Logan’s part. Back at the Blackfoot Indian camp, a beautiful young Indian girl, Sparrow Hawk, nurses Logan back to health in return for saving the Indian youth’s life. Unfortunately, the youth is not as hearty as Logan and permanently loses his sight from the demonic attack. 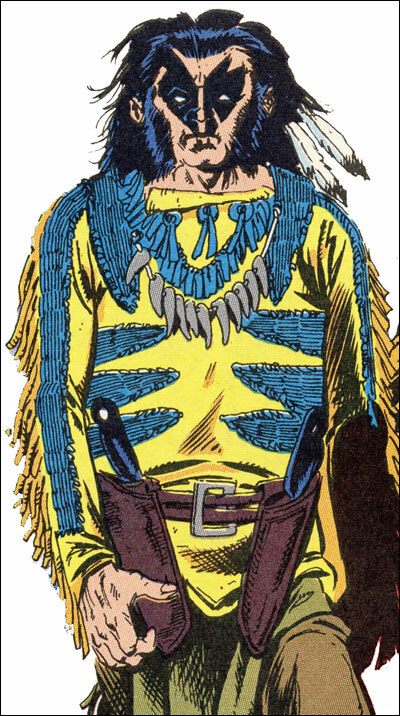 In a show of affection, Sparrow Hawk gives Logan an Indian shirt she embroidered (looking suspicously like his future superhero costume), which causes He Counts Horses, a young Indian warrior, to attack Logan in a jealous rage. Logan quickly defeats the warrior, but their quarrel is interrupted by a demonic horse whose appearance represents an Indian prophecy for the end of the world. That night, the mighty demonic worm Uncegila attacks the Blackfoot camp, and He Counts Horses is badly poisoned during the fight. As Logan rescues the injured brave, Uncegila ventures deeper into camp, devours the beautiful Sparrow Hawk and disappears. Logan descends into a frightful and furious rage and vows to hunt down and kill the demonic worm. In the morning, Sparrow Hawk’s father, Buffalo Snort, decrees that Logan and the blind Indian youth will set forth to fight Uncegila, smearing warpaint on Logan’s face that looks very much like his future Wolverine mask. By evening, Logan and the youth find the demonic creature sleeping in a nearby cave. The boy warns Logan that to look into the eyes of the Uncegila is certain death, just as the demonic creature awakens. As the the horrible worm rushes forward, the blind youth shoots Uncegila at close range in the head with Logan’s rifle and severely cripples the demon. As the creature writhes in pain, Logan attacks and kills the worm when he buries his knives into the beast’s heart. With Uncegila dead, Logan and the youth return to camp where Logan is given an honorary Indian name of Skunk-Bear. When Logan balks at the honor, he is told that the animal is called Carcajou in French-Canadian, better known in English as Wolverine. As the story shifts back to modern day, Logan is shocked to find the bones of Uncegila in a cave, confirming that this adventure did in fact take place. When Cyber tells Wolverine about the prominence of the Hudson family throughout Logan’s life, Wolverine flashes back to when he worked for the Hudson’s Bay Company. Considering this recollection takes place after Logan has retained his full memories, this seems a likely confirmation of the previous events. Wolverine tells Nick Fury, “I ended up doin’ work for the Hudson Bay Company, ‘protectin” the company’s interests from the locals.” In the flashback, Logan is shown killing two men, presumably Americans trappers in Canada. Originally the MCP story took place in the early 1830s because Logan references Jim Bowie giving him his hunting knives. “My claws! A little gambler from Natchez once gave’em to me himself… Last I heard he was hold up in some god forsaken mission down in Texas with the whole Mexican army after him”. But yea with the established continuity this has to be looked over as a error. My mistake the battle of the Alamo took place in 1836, sorry.